A lovely part of the Mokihinui River saved from inundation. Perhaps this river should have been saved, but we need some rivers for industrial purposes, including power generation. It’s wrong to say we must never use the earth’s resources. What do the Greens want? On the surface, this is an example of the extreme green position. Don’t touch the earth, don’t change it for any reason, never mind the benefits. Never mind that we have no other resources (there’s just the one planet, you know), but we can’t use these resources, because we’ll kill a few snails. The Green Party is crowing about this victory, which is fair enough, but it says all rivers should be protected. This is wrong. The Mokihinui might have special qualities that deserve protection, but it would be anti-human to deny access to all rivers. People of the Green Party should hear this. Snails don’t matter; on the other hand, we and our children do matter. The Greens have been advocating the use of only renewable sources of energy for many, many years. So why do they oppose hydro generation — the most renewable of renewables? Yes, we must drown a valley, but Nature does the same after every ice age — on a giant scale. Yes, a giant snail might die, or even become extinct — then you can be a hero: save the snail — but don’t deprive the country of a good energy source. Why would you? What do you want? The project would destroy 300 hectares of native habitat from over 13 MILLION hectares nationally, so what’s the problem? You could take some of the wildlife and settle them elsewhere, although the tiny loss of populations would scarcely matter. Sure, we love our wild rivers and we want them in good condition. But there are many of them and if we want a secure, renewable energy supply, we have to make some sacrifices. I suggest we don’t include this river in the Kahurangi National Park, as Dr Norman suggests, because it’s obviously a suitable site for a hydro station. Our population will continue to increase (assuming we don’t all end up in Australia) and if we later decide we need the hydro generation after all, we would face extra hurdles in building it. It’s taken Meridian five years of battling the ecomentalists to eventually abandon this power project. Imagine how long a battle it would be if the land were part of a national park! And what a supreme waste of money. The cost to Meridian will be made up through increased power prices to poor people. Welcome to New Zealand. As to irreplaceable losses of “treasured” native species, that’s a fraud, Norman. Unless this is the only valley in which they live, no species will be lost. Anyway, we’re quite capable of farming these creatures. Then we could release them into as many valleys as we like. There’s no need for a shortage, Russell. If they’re rare, why are they rare? Because they failed to adapt. We should let them extinguish themselves — that would be the natural course — but no, the Greens must save them. It’s cold-bloodedly criminal that they’ll intervene for a failing species of invertebrate but tell fellow human beings to keep their hands off resources they need and risk their own extinction. What perverted, distant, barbarous logic. Greens say they want to save the earth, not for us but, ironically, for itself. I say the earth doesn’t need saving, it’s fine — but it could do with a lot more care. We need to take the necessary resources while taking good care. Turning that around: we should care for the earth to secure the nourishment and betterment of humanity. Now there’s a cause! Actually I am somewhat on the side of not damming this river. Not ALL rivers I might add, but the West Coast rivers and bush are particularly special in my view. I live in South Canterbury, and we have lots of hydro here, so I can hardly be accused of NIMBYism. The local Lake Opuha is used for Hydro energy and irrigation, and has flooded a small part of the plains. It forms a great resource for watersports and fishing. There is quite a lot of potential Hydro on the coast apart from the Mokihinui that is less sensitive. I am in general in favour of hydro energy, but not in favour of flooding pristine wilderness rivers that are second to none in the world. Fair enough, Andy. The problem is with enviros who won’t allow industrial uses of any river. Do you know why Meridian chose the Mokihinui over the less sensitive West Coast hydro potential? Oh dear. And in spite of the bribes, er, sorry, gifts, the decision still went against Meridian. Damn! It’s interesting that the local iwi don’t hold much sway! We are confused by this question because we think the Greens are humanists and cooperative in principle. We think the Greens want to work together to create a more just, simple and humane life in which the non-human world is respected and treated in a bio-sustainable way. We are wrong. The Greens want Mankind’s influence not just reduced but eliminated. They want us gone, gone from “natural” areas, i.e. non-cities. Their preference is actually that the cities, or most of them disappear also. Which means that most of us disappear first. The Greens are, by nature, anti-human. They are pro-wild. We thought they were conservationists when we read Rachel Carson’s book, when they blocked old growth forest lumbering, when they got natural areas protected. But they were actually preservationists – no development, no people. Just nature, doing its thing. What do the Greens want? Renewable energy? Not if it will impact wildlife that they can, as the Stewards of the Earth, walk in and enjoy. Wind turbines that kill birds, well they can’t see that happening, so for the moment, that is better than coal power, the smoke (and steam) they can see. The time for anti-turbines will come. There is no compromise with the Greens because the human needs come after the other biological needs of the planet. Gaia is the new God, and God takes first place around the world. Greens may be atheists of a paganistic type, but on their deathbeds they want to believe they will be going to a good place as a karmic reward, even if that “good place” is just a universal energy of the cosmos (though somehow their “spirit” survives as an individual them, weird as that contradiction is). I’ve wondered why no concession is enough for the committed Green. Now I know why. It is not good enough that in parks we only take photographs and leave footprints, as the signs request, but that we leave no footprints, either. Really. The recession has not? Shale gas is methane. Same as other gas, conventional or unconventional (shale). The only way that “shale gas” could reduce CO2 is if it displaces oil. And that process was happening regardless of gas from shale (actually, silstones or silt-bearing shales). Fossil fuel use is down everywhere because the world is in an economic slump. That is what reduces CO2 emissions. The Greens know this: that is why they want to de-industrialize the planet. Nobody working means nobody uses energy means coal, oil, gas don’t need to be burned. Just imagine what a Green Finance Minister could do for NZ! Require energy retailers to buy or generate a proportion of their sales from renewable resources. Help district and regional councils plan for wind farm sites. Support a programme to install solar water heating panels on government and private buildings. Investigate the potential of woody biomass, biofuels, and energy from waves, tides and currents. There is absolutely no mention of hydro, despite this is by far and away the biggest supplier of energy (renewable or otherwise) in NZ. By “transition to renewable” you assume that they do not consider hydro as renewable energy, and would prefer us to be burning woody biomass. The latter has caused some problems in the UK with large amounts of trucks required to deliver the biomass to the power station, and the respiratory illnesses that arises from the combustion of this material. Is it possible that shale gas is displacing coal in energy generation? I forgot to add that Geothermal energy has no place in the Green’s energy policy either. We have abundant “free” energy from geothermal. Investigate introducing ‘progressive pricing’, whereby the more energy you use, the more you pay, above a certain base level. That’s a good question what do Greens want? Maybe impoverished Indian style energy use. Burning Cow dung. Cute! But impoverished would be right. Electricity prices in Germany are exploding. This puts it in perspective. It’s beyond frustrating, it reaches criminally negligent. I doubt we’ll hear much on this from our Green Party. It would be uncomfortable for them. To be absolutely correct, the photo of the mokihinui would have been unaffected by the dam as it is some kilometres downstream of the proposed dam site. The river flood often so rising and falling river levels from hydo operations wouldn’t have changed the ecosystems. The Mokihinui isn’t pristine either. If one actually reads the report that was claimed showed the Manawatu was the “dirtiest” river in the world, you will see the Mokihinui isn’t much cleaner if judged by ER. That fact got glossed over in the publicity. Note how the river’s ER was 22.6 where anything over 10 is bad. The GPP is also over the poor eco-system limit as well. The river offered the bggest bang for the buck of any west coast hydro and was far from fault lines. Why did the need a big dam? The top half of the South Island has no big generators on the grid north of Benmore except Cobb. That means all the power system has no generators to stabilise it. Those lines are heavily loaded. If 80MW of generation could have been put on the grid, then it would allow the West Coast to export rather than import power. This would lower the current carried by all the lines and put off the very expensive upgrade of all the lines. However, the Wairau scheme might provide some of the suport necessary. The other unwritten reason for the cancellation is the power demand isn’t growing, so there is no need for new generation yet. Same reason for Contact cancelling the lower Clutha. Power companies only think short term as they will be punished for building excess capacity. When Huntly shuts down and the CCGTs go open cycle because their boilers fail (another stuffup story), then the nation will be looking for generation in a hurry. Then the hydros will be back on the agenda as think big and no environmental constraints. Ah, local knowledge. Thanks for the insight, Chris! That’s great. I’ll do more stories on energy. Well actually no. i live in Taupo. However, I work in the industry and am able to read the documents that are published. 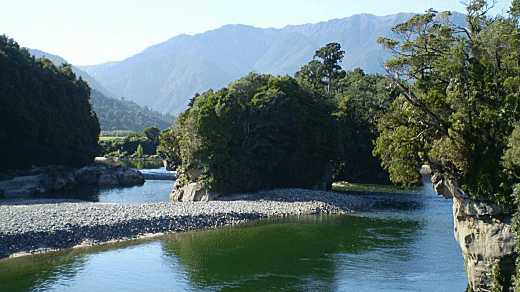 It is a proposed development around the Ngakawau River, involving tunnels off the Stockton Plateau. The Ngakawau is quite affected by mining tailings, so would benefit from cleanup which this project proposes. I agree with ChrisM that the decision to can the project was partially due to lack of demand for energy. This was one of the reasons cited for the abandonment of the Project Hayes wind farm. The most obvious change will be a dramatic improvement in water clarity and estuarine ecology. The visitor experience of the Charming Creek walkway which follows the river will be greatly enhanced. Flows over the Mangatini Falls will be reduced in volume but the quality will be significantly improved. The project will generate in the order of 240 GWhr of renewable energy per year. The drop of more than 555m between the highest reservoir and ocean outfall means that large amounts of electricity can be generated from the relatively small volumes of water that will be diverted from the main river system (4 – 9 cubic metres per second). Harnessing this renewable energy will more than meet the needs of the Buller District and ensure that the West Coast region is less reliant on remote electricity generation. The Stockton scheme is a good one, and like you say, will probably generate enough power for all of north West Coast. From the grid’s point of view, there are two problems. It has a lot of single or common plant so that any outage or maintenance will take out the whole station. that means there isn’t security of supply. The other issue is that it has very little storage so is effectively run of the river, especially in the weeks to months timescale. That means in dry weather, which has been known to happen even there, the output is very low. Chris – is there no potential for storage on the plateau? I am vaguely familiar with the area as the in-laws live in Westport. There is another small scheme (the one I referred to as “vandalised” about 10km north of Westport (before the Denniston turnoff) that has a small lake that feeds into a turbine. I also saw, on a recent trip to Wanaka, a river-fed hydro turbine that fed (I think) Mt Aspiring Station. I don’t know what the economics and politics are with this kind of scheme. I am always interested to hear the views of an industry insider. There is minimal working range and area on the proposed lake from what I have seen of the plans so that doesn’t give much potential for storage. The good old potential energy of mgh gives the amount of power storage. If one assumes 80% efficiency and given the 550m head, you can easily calculate the energy value of the water by area * working head. From what I remember of the objections by Solid energy, they were worried about it flooding workings so they probably can’t buld a bigger headpond. Also the cost of a dam goes up exponentially with height. Making a station that can stand the floods is also very expensive. There is nothing wrong with run of the river (they are a lot more reliable than wind) and are a very important part of the mix, but it is really storage that NZ needs to make it less susceptible to dry periods. That is why power stations on the lower Waitaki or the Clutha are a lot more valuable than an equivalent sized dam on a new river. The former can add to the potential value of the large lakes with large working ranges already used for storage. They can also use the intermediate power stations to do a lot more peaking as they aren’t consent constrained to the maintaining slow rates of change to the outflows. There are economies of scale for power projects, not only the installation but the cost of consents and things like tapping into the griid have a big effect. Against that, remote sites make alternatives like wind or solar viable. Getting diesel for generators makes power about 40c per unit. You can do a lot with that. Do you address me, sir? Well, don’t leave it at that. Please explain why.